Millers are always coming up with new ideas, tips & tricks that make a better, more efficient sawmilling experience. Some ideas have been incorporated into the design of the mills, as we are constantly looking for ways to improve our mills. Others are listed below. If you would like to contribute your own efficient sawmilling tip, send it through to us. Leave a small uncut 5mm ledge before making the finished cut, so the ledge supports the weight of the double-width board. This offers an alternative to wedging. Try cutting the back-cut first. This allows you to visually line up the second cut with your standard cut. You can easily adjust the winch up or down to line up the cuts, without having to walk around to the other side of the mill. Before sharpening your blade, take the top slab off your log. The first slab dulls the blade the most, due to the large amount of grit and bark. Doing this first, will prolong the duration between sharpenings. Leave a small ledge on the log, placing the board to be re-sawn next to it. Double-cut the board, so when pulling back on the mill, the blade forces the board against the ledge, and prevents any movement during the cutting process. It’s a good idea to do the vertical cut first when you’re at the bottom of a slab. 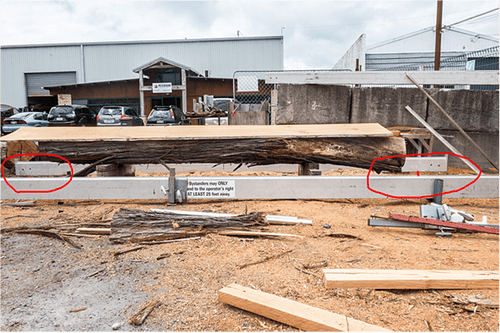 If the horizontal cut shifts the slab sideways, the timber is already edged so your boards should still come off fine. 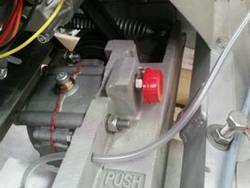 Place a bottle cap over the lead-in adjustment bolt A, this will save you from having to play around with the lead-in adjustment every time you perform a double cut. When you have finished double cutting simply remove the bottle cap. For holding logs in the right place, make yourself a couple of good large hardwood skids, and cut out a series of different sized notches as shown. If you wish to cut several boards that will later be glued together for table or bench tops, number each piece as it comes off the log. That way you can easily match the grain later after drying. As you start to cut a vertical board, adjust the board remover so it slides next to the board. When you come to the horizontal cut, you will stop any sideways movements of either the mill or the log. It is better to have the log on the ground during slabbing as this stops any sideways movement. If you are using skids, make sure they are big and have good notches. If you are able to, angle your log on a downwards slope, so gravity helps to feed the slabber through the log. This helps prevent both operator and engine fatigue. 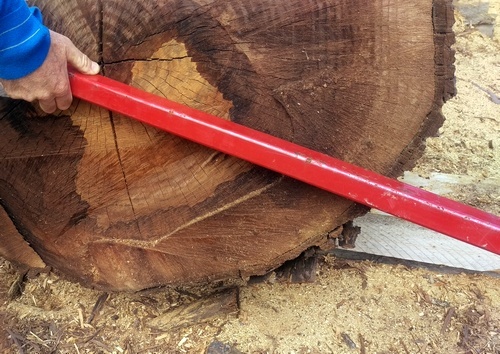 When cutting low on a log that has tension, leave an edge on the right hand side of the log. This will give more support to the log and provide more accurate last boards and will stop the log from sagging and moving. 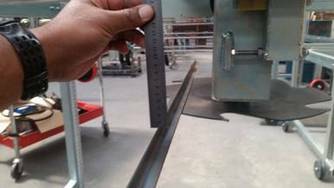 Sight the blade in both horizontal and vertical positions, to ensure that your log is parallel before you begin milling. Use three skids for bunk supports to stop the bottom slab from collapsing as it cuts. This will allow you to get maximum yield from any given log. It also stops the bottom slab from sagging or bouncing. Make a pair of ramps easily, by first cutting an 8×8 beam. Put it back onto the log at an angle, and cut vertically as per normal. These can be used to help roll logs over your tracks easily. 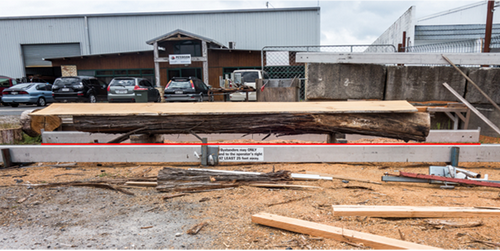 The weight of the beam will keep it in place as it is being cut. A lot of beginner sawyers cut V’s out of their log bunks to hold the log in place, but these often do not work. Instead, cut out actual square notches. Cutting large 8″ x 8″ bunks, rather than small supports, is also more beneficial. 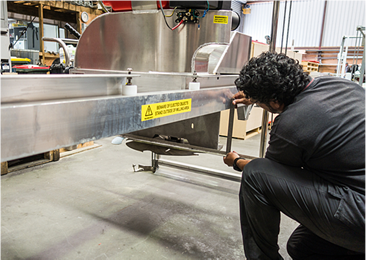 Take wind direction into account when setting up your mill, so as to avoid inhaling excess sawdust and exhaust fumes. Use a stick or similar to correctly line up the centres of both sides of an oddly shaped log with the mill tracks. This way you will optimise the output of hardwood (closer to the centre) as opposed to sapwood (closer to the bark). The track frame must be parallel for this to work. Do not over-push your mill – listen to the sound of the engine and let the blade do the work. If you feel you need to over-push, your mill probably needs an adjustment. When you are wheeling the carriage into position over the tracks, do not push it forward and attempt to roll it over your skids. Instead, reverse it in, and ease the wheels over the skids while pulling backwards. When using an ATS model, clip-on, or dedicated slabber, try rolling the black carriage wheels to engage the bar into the log. This makes it easier, not having to push it through. Turn the water off when doing your sizing, so that you don’t waste water. Reset the sizing device while you are cutting, to save time at the end of a cut. Provided the board remover is off, you can reset the dial while you are cutting on the ASM also. Before you do a cut, lock your sizing device in the reset zone, to completely eliminate any centre unit sideways movement. You can actually steer the timber left or right as it is being removed, using the reset switch, making it easier for the tailer. This also keeps the boards from falling off the side of the log. 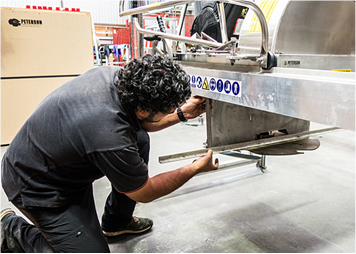 When strapping down your mill for transport, an alternative to strapping the bed is to go over the top of the frame. This will prevent chain stretch, which may happen as the bed is pulled down, which can then upset blade adjustments. Put some household dish washing liquid in the water container to reduce friction on the blade, and also algae build-up in the container. Buy a tin of silicon spray and use it daily on your chains, top turning shaft, and bed sliding areas. Here are a couple of photos on what to look for when checking to see if your tracks are parallel. Line up the top of your closest rail to you with the bottom of the rail furthest away from you. You can see in the picture that the rail furthest away from you is higher. We need to lower that rail down slightly. We have now lowered the far rail. We now look along the entire length of your tracks and we can see all 4 corners are parallel (level with each other). Please note you could also raise the track closest to you to achieve the same result. You can also place a spirit level on the center of your red track skids and as long as the air bubble is in exactly the same position for both Red Track Skids your track should be parallel.